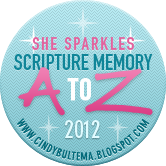 Little Writer Momma: A Fun Way to Memorize Scripture with Your Kids!!! Do all you mommas remember how many letters are in the alphabet...I only ask because I had to stop and think twice and count on my fingers once...(this is happening more and more these days...uh oh!). I'll give you a little help...26! And how many weeks in the year? That means if you focus on memorizing one scripture with your kids for two weeks straight, by the end of the year you will have memorized 26 scriptures together! This week Cindy is starting with "A"
How fun and exciting is that...I LOVE a good and easy plan, especially the first week of a New Year when I'm already fearing my resolutions slipping through my fingertips...or maybe it was through the extra warm down comforter that kept me in bed too long to get a good jumpstart on the day this morning...Whatever the reason...THIS I can do. Here is the best part...Cindy over at She Sparkles has it ALL planned out for you...you don't have to do a thing except visit her blog every other Monday to copy down the new verse. If you head over there today and leave a comment by tomorrow you will be entered to win a fun prize! It is so good to meet you! 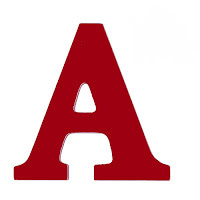 I linked here from the A to Challenge ~ and I'm so glad you did! I loved your "I'm Back" post! I'll definitely be back too! Thanks for sharing the A to Z Challenge on your blog. I'm looking forward to journeying together with you! May God bless you as you hide His Word in your heart!